Sonboli, A. (2015). Biological activity of various extracts and phenolic content of Micromeria persica and M. hedgei. Research Journal of Pharmacognosy, 2(4), 27-31. A. Sonboli. "Biological activity of various extracts and phenolic content of Micromeria persica and M. hedgei". Research Journal of Pharmacognosy, 2, 4, 2015, 27-31. Sonboli, A. (2015). 'Biological activity of various extracts and phenolic content of Micromeria persica and M. hedgei', Research Journal of Pharmacognosy, 2(4), pp. 27-31. Sonboli, A. Biological activity of various extracts and phenolic content of Micromeria persica and M. hedgei. 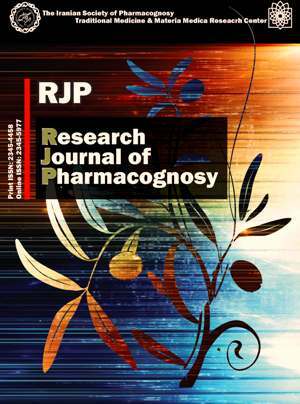 Research Journal of Pharmacognosy, 2015; 2(4): 27-31. Department of Biology, Medicinal Plants and Drugs Research Institute, Shahid Beheshti University, Tehran, Iran. Background and objectives: Lamiaceae members have long been used in Iranian Traditional Medicine (ITM) for their various medicinal properties. The main objective of this study was to evaluate the antioxidant capacity and antimicrobial activity as well as the total phenolic content (TPC) of the various extracts and fractions of two Iranian endemic Micromeria (M. persica and M. hedgei). Methods: Plant materials were extracted with methanol by maceration for 24 h. Then, the methanol extract (ME) was further fractionated to obtain the chloroform (M-C) and water (M-W) fractions. The antimicrobial activity was investigated against seven Gram-positive and -negative bacteria and three fungi. Antioxidant activity was evaluated by DPPH method and the data were compared with their total phenolic contents. Results: The nonpolar sub fractions (M-C) of both plants were active against pathogens especially Staphylococcus epidermidis and Bacillus subtilis with equal MIC values of3.75 and 7.5 mg/mL, respectively. Antioxidant activity evaluation showed that the polar fractions of both Micromeria species were stronger than nonpolar fractions, while the more considerable effect was observed for the water soluble fraction of the extract for M. hedgei with IC50 value of 59.1 µg/mL in comparison to M. persica (IC50 = 76.3 µg/mL). The highest gallic acid equivalent (GAE) total phenolic contents was found to be 263.5 ± 1.5 and 256.3 ± 3.1 mg/g dry weight for M-W extracts of M. hedgei and M. persica, respectively. Conclusion: The results indicated that the two species might be suggested as new potential sources of natural antioxidant and antimicrobial agents. Mozaffarian V. A dictionary of Iranian plants names. Tehran: Farhang Moaser, 1997. Rechinger KH. Flora Iranica. Graz: Akademische Druck and Verlagsanstalt, 1982. Güllüce M, Sökmen M, Şahin F, Sökmen A, Adigüzel A, Özer H. Biological activities of the essential oil and methanolic extract of Micromeria fruticosa (L.) Druce ssp. serpyllifolia (Bieb.) PH Davis plants from the eastern Anatolia region of Turkey. J Sci Food Agric. 2004; 84(7): 735-741. Ali-Shtayeh MS, Al-Nuri MA, Yaghmour RM, Faidi YR. Antimicrobial activity of Micromeria nervosa from the Palestinian Area. J Ethnopharmacol. 1997;58(3): 143-147. Kirimer N, Başer KHC. Essential oils of Micromeria species. Proceedings of the 11th International Symposium on Plant Originated Crude Drugs. 1996 May 22-24; Ankara, Turkey. Öztürk M, Kolak U, Topu G, Öksüz S, Choudhary MI. Antioxidant and anticholinesterase active constituents from Micromeria cilicica by radical-scavenging activity-guided fractionation. Food Chem. 2011; 126(1): 31-38. Stojanović G, Palić I. Antimicrobial and antioxidant activity of Micromeria bentham species. Curr Pharm Design. 2008;14(29): 3196-3202. Vladimir-Kneževic S, Blažekovic B, Štefan MB, Alegro A, Koszegi T, Petrik J. Antioxidant activities and polyphenolic contents of three selected Micromeria species from Croatia. Molecules. 2011; 16(2): 1454-1470. Halliwell B, Gutteridge JM. Role of free radicals and catalytic metal ions in human disease: an overview. Method Enzymol. 1990; 186:1-85. Witschi HP. Enhanced tumour development by butylated hydroxytoluene (BHT) in the liver, lung and gastro-intestinal tract. Food Chem Toxicol. 1986; 24(10-11): 1127-1130. Schuenzel K, Harrison M. Microbial antagonists of foodborne pathogens on fresh, minimally processed vegetables. J Food Prot. 2002; 65(12): 1909-1915. Bozin B, Mimica-Dukic N, Samojlik I, Jovin E. Antimicrobial and antioxidant properties of rosemary and sage (Rosmarinus officinalis L. and Salvia officinalis L., Lamiaceae) essential oils. J Agr Food Chem. 2007; 55(19): 7879-7885. Slinkard K, Singleton VL. Total phenol analysis: automation and comparison with manual methods. Amer J Enol Viticult. 1977; 28(1): 49-55. NCCLS (National Committee for Clinical Laboratory Standards). Performance standards for antimicrobial susceptibility testing. M100-S9. Wayne: National Committee for Clinical Laboratory Standards, 1999. Larson RA. The antioxidants of higher plants. Phytochemistry. 1988; 27(4): 969-978. Maksimović Z, Malenčić D, Kovačević N. Polyphenol contents and antioxidant activity of Maydis stigma extracts. Bioresource Technol. 2005; 96(8): 873-877.